In 2012, Spaceport America was completed in the middle of nowhere, New Mexico. The closest town has the unusual name Truth or Consequences, some 33 km away as the crow flies. 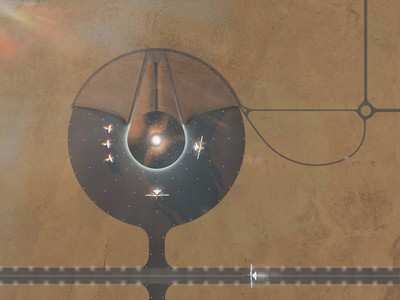 In all the vastness of the desert, Spaceport America was constructed right on the button at 33°0’0″N. Today I felt inspired to measure the distance from the end of the runway at Spaceport America and see where the ruler tool in Google Earth wanted to take me. Before I tell you what I discovered, let me rewind and give you some background. I am a long time trekkie, and just enjoyed watching J.J. Abrams’ Star Trek Into Darkness two nights ago with my son (tonight we watched two episodes of the Enterprise series). Normally, I don’t mention much in the way of popular culture in this blog, but for me Star Trek is more than light entertainment. Gene Roddenberry’s mission of multi-cultural exploration of space, seeking out new life and new civilizations, has always captivated my imagination. I’ve often wondered what humanity could do if we would act out of mutual respect and appreciation for our differences and begin to cooperate in a common enterprise, in something like a United Federation of Planets. Spaceport America is one of the places where something like that might literally take off for humanity. Knowing this, I dragged the ruler in Google Earth from the end of the Spaceport America’s runway to the center of the closest thing we have today, the General Assembly dome of the United Nations in NYC and was surprised that it measures exactly 3330333 yards. Michael Jones, chief technologist of Google Earth has cited Star Trek as his inspiration in the development of Google Earth (source). The UN flag’s has 33 sectors dividing or uniting the earth, depending on how you see it. Around the time of my birth humanity seemed to be going in an expansive direction with the Moon landings, although doubt has been cast on whether that was actually achieved or what was truly found there. I wish we’d get the truth out of NASA or make them face the consequences. Interesting that the Saturn V rocket that made all the Moon shots had a 33 foot diameter and propelled its payload just beyond 33 times the speed of sound to reach escape velocity. The speed of sound in air is 333.3 m/sec at 3.3°C. The weight of our atmosphere is equal to a column of water 33 feet high. The Sun is 333000 times more massive than the Earth. The conspiracy is cosmic in scope. Here is how Werner von Braun and Walt Disney imagined exploring the dark side of the Moon some 60 years ago. Scrub to time index 42m 45s and watch for a minute or so. I too get a high geiger count at 33°, and I’m not ruling out aliens. Walt Disney’s Club 33 tells me he didn’t either. The era of governments funding big space programs is largely over and it is now increasingly up to private enterprise to make it happen. It’s too bad that Virgin Galactic’s spaceplane crashed. It is now unclear whether the handful of individuals who have paid $250,000 each to journey into space for a few minutes will ever get to take their pleasure trips. Humanity should dream bigger, infinitely bigger! Scotty wants to beam up already. Update: Spaceport America’s future is uncertain. Is America to really be a spacefaring civilization or just create cool sci-fi? Maybe the UK will make it happen?. Another fantastic post Scott! I completely share your thoughts and hopes for Humanity with the United Nations / United Federation of Planets comparison, it’s something I’ve often thought myself, being a bit of a trekkie. I think thats what makes Star Trek so special, its a positive, optimistic future because most Sci-fi stories are usually apocalyptic or dystopian. Just to let you know – to a fellow trekkie…there IS a Galactic Federation. For a long time, we have not been allowed to join. It appears that that is changing. I am a remote viewer, trained by the guys from Project Stargate. I got my degree is parapsychology, 35 years ago, studying with a professor who helped set up the remote viewing program. Read Ingo Swann’s book “Penetration”. It just came available on Kindle. Paperback versions were running upwards of $2,000 on Amazon! Ingo passed away…, but a lot of his work is still available to read on his website….biomindsuperpowers.com. Ingo developed the remote viewing training, used by most of us today. Your website is great. I’m learning some interesting stuff here! The jcn program is a gift!- but may have to start using my middle name- better numbers…..
I’ll be honest and say that what you said seems farfetched but I guess if the Universe is God and we are focused points of awareness within it, I can almost imagine how it might be possible to experience something like remote viewing. I’d never heard of it before so thanks for bringing into my focused awareness! I suppose one might ask: Why have we not been accepted? And why does that seem to be changing? hi scott, good stuff as always and a pleasure following your work..
i’ve stumbled upon/experienced many co-incidents..
for example i often check the time at 1:11, 2:22, 3:33, 4:44, 10.08, 11:11, 10:10 etc, un-consciously (or so it seems). seems kinda spooky and i’m not sure what is going on..
is it synchronicity?? a hidden meaning? an internal awareness to something outside the physically reality?? i’m not sure but something inexplicable (so far) is happening..
i think that the numbers surely have a deeper meaning about the reality we perceive..
so far having read/researched many topics on comsology/astronomy etc., i NOW see that there is really no past,present or future..
what i perceive is that there is an cyclical/infinite NOW..
in our physical reality we deal with the three properties of space; length, width, height (which gives volume) and one property of time…thus we can only be IN one place at any given moment..
but in our infinite consciousness we deal with the three properties of time; past, present, future and one property of space…thus our consciousness exists forever in time..
fact: at any given moment we think about three things simultaneously; what we are doing NOW, what we’ve done in the (PAST) NOW gone and what we will do in the (FUTURE) NOW to come..
isn’t it amazing how our consciousness move in/out in a cerebral reality?? one final thing, is this a co-incidence or something hidden through the ages?? can anyone take a look at the aerial view of spaceport usa and tell where i’ve seen that image before? i get an uncanny familiar feeling about that image but can’t quite put my mind/hand on it..
Have you guys ever studied geometry at kailasa? I did some research and found some group called ” Zero G colony” and they are partners i think with virgin galactic and they own spaceport america. THey are using the spaceport to send, get this, lady gaga to space and she’s going to perform in space. wonder who the members of this colony are something you should investigate i think!